I bought a new printer, the Anet A8, which is a Prusa i3 clone. From the prints shown on the “official” Anet A8 support group on Facebook, it’s a very good printer indeed for its price. The Facebook community are also avid upgraders and publish a lot of posts explaining what they’re done. My previous machine was a Makibox, which rapidly fell apart. Even when combined with the parts from a replacement Makibox, it still only lasted a few more weeks, and all prints done from it were fixes for itself. I’ve had problems with the A8 already, but the community is very good and the printer is common enough that there are plenty of articles online about it. Z-axis motors out of sync. There are two motors controlling the z-axis (up/down). They both run basically through the same circuit. If they don’t receive the same power to both, then one might be a bit jerky or not move at all. On the Anet motherboard, there is a potentiometer between the two Z-axis controllers (looks like a little silver circle with an X in it). I just turned that 1/4 to the right and that fixed my problem. 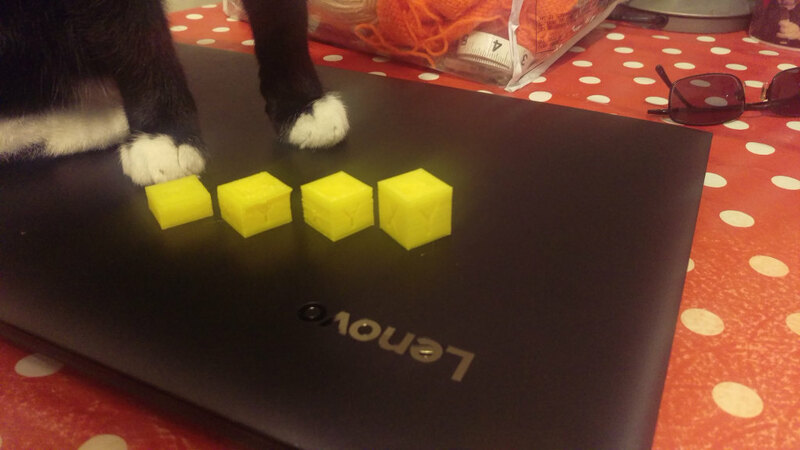 I printed out a calibration cube and it was only half the height it should be – 2cm*2cm*1cm instead of 2cm*2cm*2cm. The problem here is a mixture of the slicer’s code, and the firmware of the printer itself. I think I have this sorted now – the steps per mm were off in the Z-axis. After some experimentation with the console in Pronterface (and some measurement of movements with a ruler), I think I got it right. List of gcodes are here. clogged nozzle. Well, this one is an old friend… Sometimes you will find that the extruder doesn’t extrude anything at all. In my case, it was a clogged nozzle – there was a lump of plastic at the top of the throat leading down to the hotend and nozzle. I had to melt it out with a tea-light candle, because it was just /not/ moving. I then poked a guitar E-string through the end of the nozzle (0.4mm – too thin for a needle) to make sure that was clean. cables a little too short. There is no “play” in the cables, so I found that sometimes the extruder stepper’s controller wires would literally get pulled out as the X-carriage moved. Solution – remove the clip that was holding the black plastic wrap to the back of the LCD, so that the wires could be moved. Overall, I am /very/ happy with this printer, but I’m still wary from my experiences with the Makibox, so the first project I’m working on with this new one is to print yet another printer – the Smartcore CoreXY.